Zoned for industry with infrastructure already in place, the Corridor of Opportunity lies within a day's reach of more than half of the markets of North America. Directly accessible to the Interstate Highway System, it boasts excellent rail access and a full-service rail yard. Additionally, it is anchored at east and west by thriving, successful industrial parks. This premier piece of property is located just minutes from the Ohio/Pennsylvania state line in the Enterprise Zone communities of Campbell, Struthers and Youngstown. 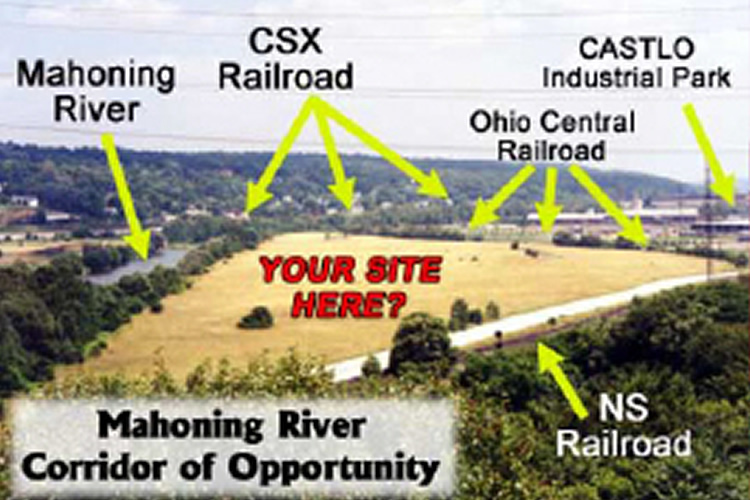 Two national railroad companies, CSX and Norfolk Southern, and the Ohio Central short line railroad traverse the site. Shipping is also available via ports on the Ohio River (35 miles south) and Lake Erie (65 miles north). Redevelopment programs in place include tax credits for purchases of new equipment and machinery for companies who qualify and Ohio's Voluntary Action Program, making the redevelopment of brownfields for industrial use economically attractive.